After our last blog gave you a foundation, we hope your closet is starting to look pretty good. If you are not quite there yet, no worries! The wardrobe that we are talking about might take you a while to complete. It is quite a process indeed, but the most exhilarating part of when we are working on something is clearly knowing the steps ahead. Let’s now imagine, for those who are not there yet, that your sartorial foundation is there, and that better yet, it is a solid, strong foundation. Remember, we told you all about the clearly important step of having the right items in your closet, but we also said that placing and maintaining those clothes are just as important. In this blog, we will give you some great tips to keep your sartorial Mecca running as smoothly as possible. The very first step is to place your clothes appropriately. For this, you will need the right tools and the proper space (if you don’t have that, get working on it). There are plenty of great custom closet companies in major cities, and they all work with similar materials, although the price varies slightly. Connecting with your designer is what really makes the difference here, so be very specific as to what you want (maximize space, organizing, et cetera). Also, request to have more than one option (a sketch or picture of what the final job will look like would be optimal). If you happen to take this on as your own personal project instead, because you’re feeling crafty and creative, needless to say, make some good use of those new tools you got from Santa. Adding shelves and drawers and extra racks will be a good idea to start with, and if you already have everything you need and just need to organize (and please keep it that way, we are not in college anymore! ), then here is what you need to do. Hang them in one side of the closet about 3 inches apart from each other, as this will minimize crushing. Keep the most expensive garments in a garment bag when it’s not being worn. Hang at the other end of your closet 2 inches apart to reduce creasing. Pants, preferably, should be hung by the hem on trouser hangers. If you are building/remodeling your closet, in the middle of your closet there should be a space with shelves and drawers. Please arrange for the bottom drawer to be a deeper one. Now we will tell you what goes in each. Those that you do not wear as often should be neatly folded and placed on the top shelf. Do not hang everything you own, this just congests your space. Fold in piles and place on the shelves, as this will prevent stretching out the shape and will make them last much longer. Fold neatly and place in smaller drawers. Remember that deeper drawer? Place those in here. The best way to store them is by folding them in half and then rolling them. Use this drawer to place pocket squares and other accessories. All in one place, and that remaining drawer is that place. Keep them on shoe trees to help keep their shape. This will triple their life span. Cedar shoe trees are a great choice, as they absorb moisture and leave a fresh scent (remember to give shoes a day off and to polish them at least every third wear). Proper hangers: general purpose, sports coat only, trousers only and suits. Wooden hangers will add a very elegant and appealing look to your closet. Remove dry cleaned items from bags and hang them on proper hangers as soon as you get home. Keep a lint roller and a cloth brush with your suits. They will become your suits’ best friends! Keep a closet or designated space to storage off-season items. Moths off! 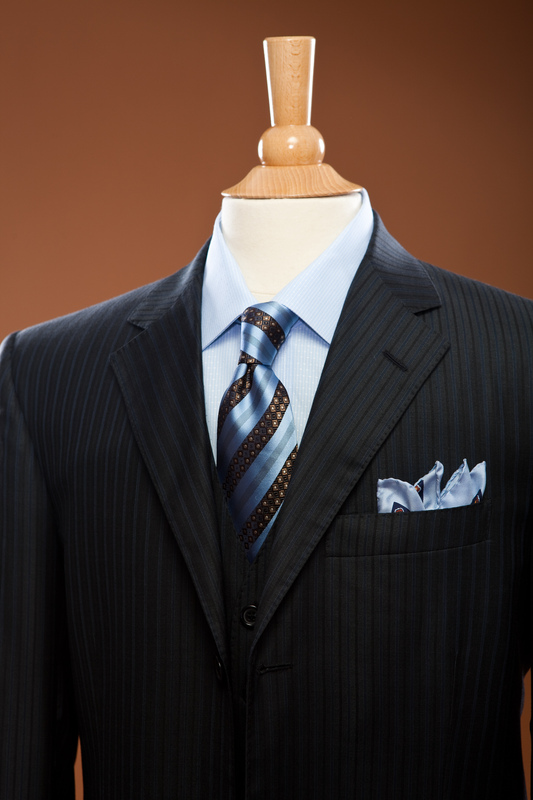 Use garment bags to store off-season suits, as this keeps them away from dust, insects and fading. Please, please dry clean or wash all-wool items before storing them away for the off-season. Space bags/other tight-sealing containers are perfect for that. Emptying and airing the contents of your wardrobe regularly is a great habit. Add some cedar blocks or chips to keep your sartorial sanctuary smelling fresh. One more thing… We hope there is plenty of room left over to keep adding great pieces to your amazing wardrobe!